India today created history, launching ten satellites in one go with its Polar launch vehicle carrying the heaviest payload of 824 kg. 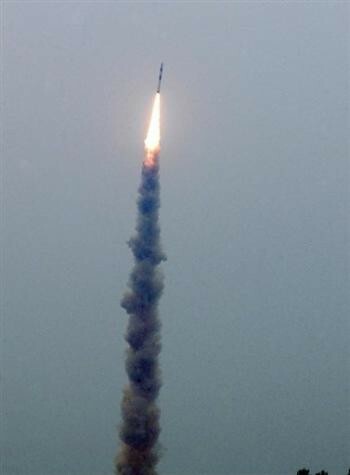 The ten-pack launch of the Indian Space Research Organisation (ISRO) saw the 230-tonne Polar Satellite Launch Vehicle (PSLV-C9) put into orbit an Indian Mini Satellite and eight foreign nano satellites besides the Cartosat-2A remote sensing satellite. This is for the first time that ISRO has put ten satellites into orbit in a single launch. A Russian rocket last year delivered 16 satellites in the outer space but the Russian launch vehicle carried a lesser payload of only around 300 kg. However, ISRO Chairman G Madhavan Nair told reporters that Russia had tried to launch 13 satellites in a single launch. "We have showed the world we can have multiple launches carried out in a precise manner. We have set a record. Only Russia had so far tried to launch 13 satellites in a single launch and I am not sure whether that was successful," he told reporters here. He said there was some anxious moments due to some unusual weather condition over the Bay of Bengal off Andaman coast. "Only at 11 pm last night we decided to go ahead with the launch." Nair expressed happiness that all the mission objectives were achieved with precision and all systems functioned very well. India will be in a position to carry out a manned space mission within seven years from now, said a top official of the Indian space agency in Sriharikota on Monday. Addressing the media after the successful launch of 10 satellites in one go, Indian Space Research Organisation (ISRO) chairman G Madhavan Nair said: "The government has given us pre-project funding of Rs 950 million (for the manned mission) and we have initiated necessary activities." Asked about the need for a manned mission when tests could be conducted remotely, he said: "Today the US, Russia and China have a capability to have a manned mission. We cannot be left behind in the space race. Further, man’s presence is absolutely necessary in a spacecraft for conducting some experiments." The manned mission will be in ISRO’s second and more powerful rocket geo synchronous launch vehicle (GSLV). "We have to study issues like crew module, emergency escape system, provision of all-round outside view from the spacecraft for the crew. These are complex systems that ISRO has to tackle," said K Radhakrishnan, director of the Vikram Sarabhai Space Centre, on the complexities involved. ISRO will first put out three unmanned rockets to test the systems before sending a rocket with a man. This entry was posted on Monday, April 28th, 2008 at 7:18 am	and is filed under Around the Blogs, Astronomy. You can follow any responses to this entry through the RSS 2.0 feed. You can leave a response, or trackback from your own site.